All the top professional stars in the country roll a sharp-breaking hook ball. Let me describe it for you: the ball starts out on almost a straight line toward the pins, but as it nears the pins, about two-thirds of the way down the lane, it breaks in sharply toward them. This is the kind of ball that gives you high scores the one to strive for on both strike and spare shots. The hook ball traces the path I’ve described because of its action on the lane. First it spins, then rolls. It spins as it leaves the bowler’s hand and continues its spinning action on a straight path until it reaches a point about one-half to two-thirds of the way down the lane. Then it begins to roll. The nearer it gets to the pins, the more rolling action it develops. By the time the ball moves into the pin setup, it’s in a full and complete roll. We call this a semi-spinner. 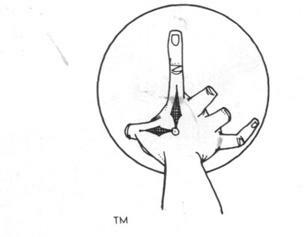 This is the hand position for a straight ball (right).Here’s the perfect release for a hook ball. This will result in a back-up or reverse hook (right). The curve ball forms a complete arc from the foul line to the pins. 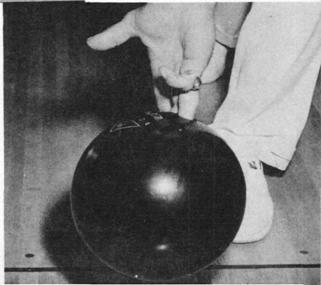 It’s better than a straight ball for knocking down pins, but if you roll a complete curve, you will find you will be bothered by ten-pin or five-pin leaves. It’s better to strive for the hook. The positioning of the hand, wrist and thumb determine the amount of hooking action you give to the ball. As you release the ball, keep your hand set in the “shake hands” position I’ve described, with the thumb between nine o’clock and twelve o’clock. 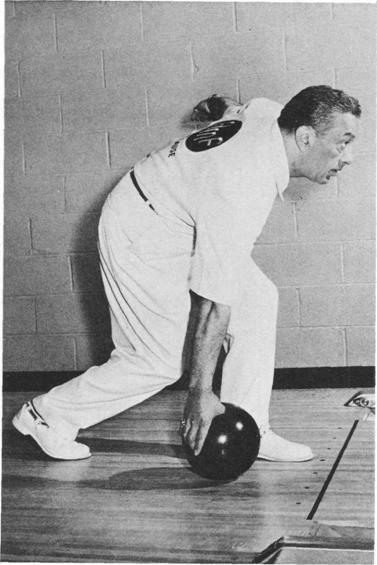 Try to lay the ball down just over the foul line not far out on the lane.Sometimes bowlers are bothered by too great a hook. The easiest way to cut down the hooking action of your ball is to increase its speed. Speed will give the ball more spin, less roll and cut down the “biting-in” action of the ball on the lane. Another way to cut down the size of the hook is to change your spot, or your target, to a point further down the lane. But changing speed is tricky! Don’t let your timing be affected. Many women bowlers not the professional women stars, but the beginners or amateurs roll what we term a “backup ball,” or a reverse hook, or reverse curve. It’s a natural action for a woman because the structure of her arm is slightly different from that of a man’s. 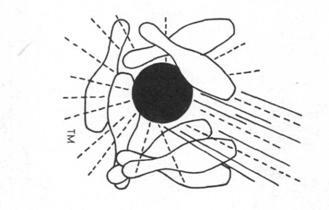 One of the muscles of the forearm is positioned in such a way that it becomes quite natural for a woman to impart a clockwise spin to the ball, giving it a reverse hooking action. To overcome this tendency, women should strive to release the ball in the shake-hands position I’ve recommended. Releasing the ball properly, for both men and women, is more a matter of concentration than anything else. The release usually goes awry sometime during the backswing. The bowler becomes intent upon his delivery, and he breaks his wrist. Concentrate on keeping your wrist straight and firm from the moment the pushaway is initiated until the follow-through is completed. Now that you have mastered the approach, delivery, and release of the ball, you must learn to acquire accuracy. 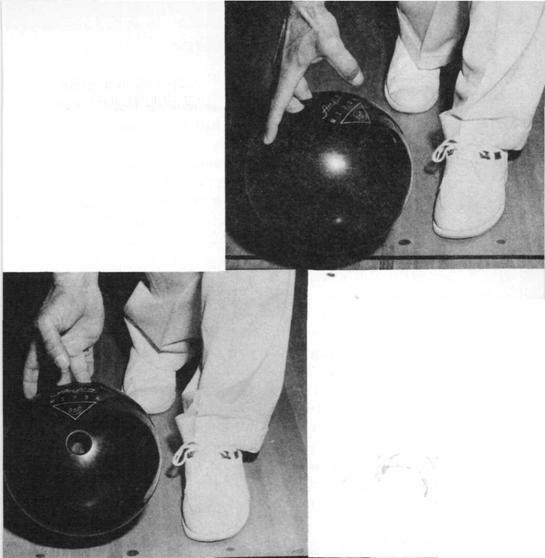 Of course, we all know the ball should strike the pins in the 1 3 pocket to achieve a strike, and further, that the hook ball, explained in the previous chapter, is the best method for hitting in the 1 3 pocket. This entry was posted on Saturday, October 22nd, 2005 at 10:50 pm	and is filed under Bowling. You can follow any responses to this entry through the RSS 2.0 feed. Responses are currently closed, but you can trackback from your own site.